The theme of the 70’s was circus, starting out as a street juggler then adding clowning and acrobatics to work with some small circuses. 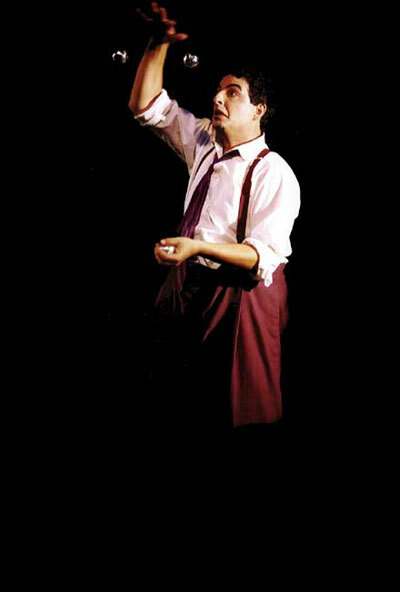 I topped off the decade with the Bay City Reds, one of the most successful juggling troupes in the country. Acting was a new theme in the 80’s as I studied and performed with Dell’Arte International and then joined the actors’ unions. Circus skills were still in the mix — I spent most of the decade with Vaudeville Nouveau — and it all came together on Broadway with a production of Comedy of Errors. Adventure was an exciting side effect with tours to the Alaskan tundra and 20 other states, seven countries in Europe and six months in the Canadian west on horseback. Writing took center stage in the 90’s when a five-month trip to Europe became my first play Father-Land. I wrote eight more plays before the new millennium, and directed many more, while performing with the Pickle Family Circus and acting in theaters around California. I co-founded The Clown Conservatory in 2000 and teaching was the dominant theme of the aughts. The highlight of the decade was a 500-performance tour with Cirque du Soleil’s Corteo, in English and Japanese, while still running the school.